Founders husband and wife Allan & Sam Watts are a normal family leading busy lives, who know how important sleep is for the mind and body. 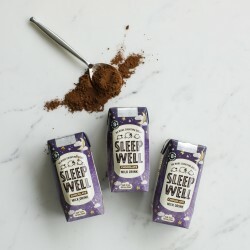 On a flight Sam bought a drink which claimed to help you sleep but contained all sorts of synthetic ingredients - and this inspired them to wonder if they could create a natural drink that was full of goodness and suitable for all the family to enjoy, that could help you relax and sleep. 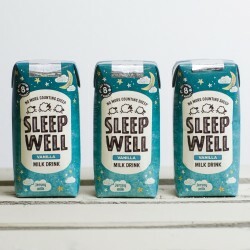 So they developed their Sleep Well drink using creamy Jersey milk from their island home, honey, and valerian root, which has been used for over 2000 years to help calm people down and get them to sleep. A natural solution to a very modern and common problem. Their Vanilla milk drink was chosen by The Grocer as one of its top ten most innovative products at the Fine Food Fair at Olympia.